(Nanowerk News) In a move akin to adding chemical weapons to a firebomb, researchers at Duke University have devised a method for making a promising nanoscale cancer treatment even more deadly to tumors. 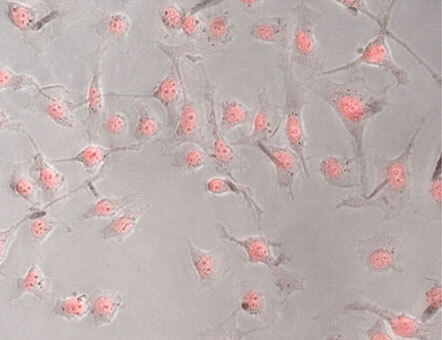 The cells in this image have turned fluorescent pink, showing that the new drug delivery system results in high cellular uptake after being irradiated by near infrared light. The technique is described in a paper published in the journal ACS Biomaterials Science & Engineering on July 13, 2015, and was highlighted as an ACS Editor’s Choice ("Hydrogel-Coated Near Infrared Absorbing Nanoshells as Light-Responsive Drug Delivery Vehicles").